Our home field is Brookwood Hall in East Islip. Like last year, we will alternate between the south and north fields, with the first pitch at 6:30. For the last two years the Seraphim have come within one game of the championship round ~ we’re looking forward to making a run at the title in 2019! The full 14-game schedule is below. Let’s go, Seraphim! The 2019 Seraphim season began on a cold April Fool’s night against the Patchogue Mighty Warriors. The Seraphim were able to field nine against a team of ten, but still managed to make an impact. The Warriors took an early lead. Then Cam hit a Cam Slam into the next field! The Warriors scored some more and the Seraphim started to come back late, loading the bases again in the bottom of the last inning but failing to convert. Final score PMW 11, Seraphim 6 ~ but hold your heads high, Seraphim! Welcome to our newest player Ashley who played second and went 2-for-3! Second Game: Only One Bad Inning! Tonight the Seraphim won four out of five innings! Not bad, right? The team got to a 13-6 lead on the back of Manager Lee, who hit a towering home run. Lots of hits, great defense, and everything was looking good as the team entered the fourth inning. Then Patchogue New Creation started hitting home runs over our heads, across the running track and into the duck poop. They ended up winning 19-14. But on the brighter side, the Seraphim scored twice as much as last week and now they have a week off! The first game of the year was snowed out, and the second took place in 39-degree weather. Our team went up against the Patchogue Mighty Warriors and took a commanding 1-0 lead in the top of the first inning. Fred had both the first hit and the first run of the season. We went on to quadruple the score in subsequent innings! Our team played hard but the other team played harder; it was a good measuring rod of where we are and where we need to be. The highlight of the game was that we were all still in a good mood when it ended, looking forward to warmer weather! 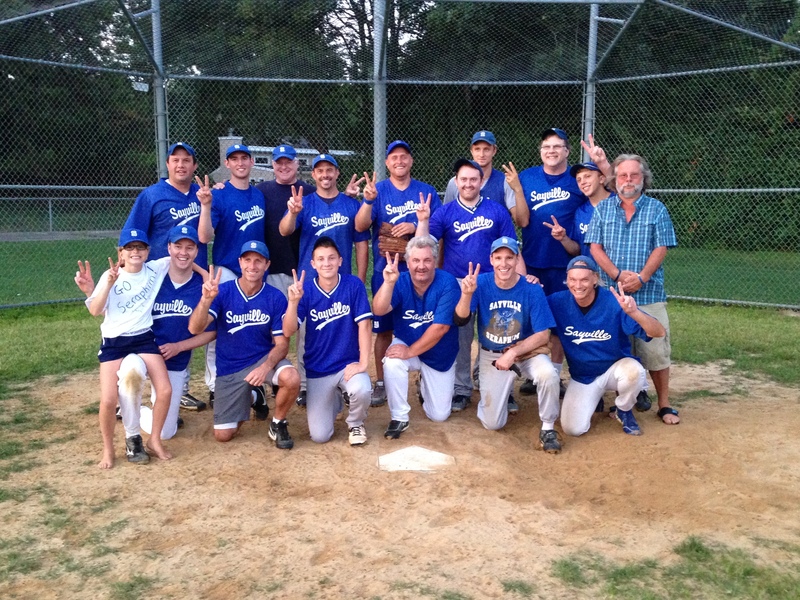 After a rainout the prior week, the Seraphim traveled to Centereach to play the Our Savior Psalms, the team that knocked them out of the playoffs in 2016. Not that anyone remembers that or keeps track of such things to motivate a team. *cough* Conditions were sunny, bright and 20 degrees warmer than the last outing. The highlight of the game was that Manager Lee hit two home runs!!! Yes, back in 2016 when Lee was hitting home runs, we were calling him “Nifty at 50.” Now we’ll have to come up with another name (“Nifty Two?”). The Seraphim roared out to a 10-0 lead, but the other team battled back with a 7-run 4th inning that closed the gap to 10-9. But the Seraphim responded with an 8-run 5th and held on to win in the bottom of the inning. It was great to get the season’s first win in the books. Game Three: Arghh, SO CLOSE!!!!!! The odds seemed to be against us from the start. Two players went to the wrong field. We forgot the pitcher’s mask. We only had 8 players, going up against 10. We had no catcher. We went down 5-0 in the top of the first inning. But man, did we battle back. Jake hit for the cycle. Ian hit two triples. The defense started to click in, with great relay throws from Ed and Matt and a double play with Jake stepping on second and throwing to Fred at first. We closed the gap to one run. In the bottom of the 5th, we put the tying and winning runs on base … but this night, it was not to be. We wanted to play another inning, but the ump called the game. This one’s going to sting for a while. So how do we channel this frustration? We concentrate on how well we did with only half a team. And we come back to play another day. There is no give in this team. Hold your heads high, Seraphim, you did your church proud this evening. Game Four: New Home Field! This evening our team was introduced to its new home field (Brookwood Hall in Islip). Turns out it’s a really good field! The town had even raked it out for us, with artistic softballs etched into the infield. The positive feeling carried into the game as well, with the Seraphim hitting well from top to bottom. Matt and Cam had home runs and Ed hit some devastating balls to right field. The score was close until the final innings, but the Seraphim seemed in control the entire way, eventually winning by seven and evening their record at 2-2. This was the most offense we’ve seen all season, as the Seraphim battled Patchogue New Creation, who had previously outscored their opponents 69-8, losing only one game (and that one by forfeit). The Seraphim scored more runs than they had all season, but they also allowed more runs than they had all season. They battled back again and again, going down 5-0 then tying the game 5-5, giving up a 12-run inning then coming back to take the lead. After six innings, the Seraphim were ahead 19-18, but the ump wanted to squeeze one more inning in as the sun was setting, and that was the team’s downfall as New Creation was able to find gaps in an outfield that was having difficulty seeing. It was a tough loss, but the team showed incredible heart. In the first inning, we saw the play of the season so far as Matt ran back at double speed to catch an enormous bomb in left field. Both Johns hit triples; in one inning, we hit three triples in a row; Cam and Jake hit home runs; and even the pastor went 3-4 and scored three times, which shows how well we hit in the lineup top to bottom. This was a game we thought we had won so the final score of 27-23 was hard to swallow. It was the most runs scored by any team in a loss this season, while the combined total of 50 runs was the most of any game in the league this season. The 23 runs nearly tripled the amount of runs scored by all opponents combined against PNC this season. We’ll be seeing this team again in three weeks and looking for a different outcome. The Seraphim played one of the strangest games of their tenure on a brilliant night in Yaphank against the Missio Messengers (formerly Temple Baptist Guard). Tino struck out three batters, including the first batter of the game. Offense was at a premium and in the fifth inning of a fast game, the score was only 2-1! It was not until the sixth inning that Ian broke the game open with what would have been a 3-run homer had he not injured his hamstring rounding first. Two runs did score, giving the Seraphim a cushion, and as Pastor Rich had taken himself out of the lineup (thinking Rob or John R. might need a break later), he went in for Ian and scored Ian’s run on the next play. Thanks to strong defense, including a key catch by Ed in right, the Seraphim won 8-4 and evened their season record at 3-3. Only half the team was available for tonight’s game ~ our brothers at Bayport were kind enough to lend us a catcher to throw the ball back to John, but with only eight players, the team was stretched to the limit. Pastor Rich ended up playing third (and made two catches by the grace of God), but the hitting just wasn’t there. Bayport surged to a 10-0 lead; Sayville started chipping away and closed the gap to 11-8. But it was just not to be. This was the complete opposite of our last game against Bayport, but our sportsmanship in that game was returned by Bayport in this game. Highlight #1 was the return of Craig to the lineup; highlight #2 was that no one got hurt. Two games next week, hopefully the lineup will be full again. The Seraphim played a solid game tonight, fielding 10 against Patchogue New Creation. Unlike the prior game against PNC (50 total runs! ), this one was about defense, most notably a huge number of double plays from the Seraphim. The Seraphim took the lead 3-0, PNC tied it, the Seraphim added three more, PNC tied it, then PNC took the lead 8-6 and the Seraphim tied it. In the top of the 7th PNC walked Jake, loading the bases to get to Ian, who had been on base every time. And Ian got another hit! Now the Seraphim were up 9-8 in the bottom of the 7th with PNC batting. First out was a force-out at 2nd. PNC had runners on first and third and sent the runner home, Ian gunned the ball to Rich at home, Rich tagged the runner out standing. One out away. PNC’s batter hit a deep fly ball, it looked like it was going to be caught … but it was missed by inches. Two runners scored, game over. The team looked so good, it was a shame to lose, but it was still a nice rebound in tone from the prior game. Next up: the Patchogue Mighty Warriors! The Patchogue Mighty Warriors are the only team the Seraphim have never beaten, but tonight they came close. In the 4th inning they had a 2-run lead. In the 5th they were down only a run. While they eventually lost, they proved their mettle, playing with only nine men and putting up a great fight. Tino pitched a solid game and there were some excellent defensive plays. A couple questionable calls on both sides almost derailed the game, but the teams were able to recover their composure. Concern now turns to the hamstrings of Ian and Jake as the team heads to an easier stretch of games (by record). We’re hoping for a full squad next week and going forward. Tonight the Seraphim played a crazy game against first-time opponent Integrity Church from Yaphank. Some of the expected things happened (home runs from Cam and Matt), but a lot of wild things as well. Rich took Jake’s place in the lineup early due to Jake’s persistent hamstring troubles. The Seraphim took an early lead, then fell behind six runs. Then they went up eight runs. Then they blew that lead as Integrity Church went on a single-inning tear, and the teams were tied 22-22! The Seraphim had the chance to win in the bottom of the seventh but were unable to do so, so we went into extra innings. Integrity scored a run in the top of the 8th. We needed one to tie and two to win. Matt got a single. Rich got a single. Next batter was out but the runners advanced. Then it was time for manager Lee to shine. Here comes the pitch and BOOM! Deep down the left field line and everyone is running as fast as they can! Two runs score, game over, Seraphim win! It was a great feeling to come back twice and win such a tight game. Next week is our double-header against Islip ~ rest up everyone, you’ve earned it! Tonight we played a double header against our friends and neighbors at the Islip UMC. We played the first game a man down and the less that is said about this game the better; suffice it to say we didn’t score any runs. So how does a team bounce back from a game like this? By remembering who they are and playing strong. Character is determined not by what happens to us, but how we react to what happens. And wow, did the team come back strong, with an 8-run second inning setting the pace. This was a game for Tino and Tino (T2 and T3), who each went 4-for-4, including a HUGE home run by the younger Tino, who also stayed in the game after a ball bounced off his face. Lee also did some great hitting and running, twice as much of the second as he was also a courtesy runner. Cam arrived halfway through the game and went immediately into the outfield, providing the team with an additional boost. Final score Seraphim 21, Prophets 11. Next week we’ll have the chance to even our record; in the meantime we’ll be keeping all our injured players in prayer: Ian (hamstring), Jake (hamstring), Chris (back), Rob (foot), and newly injured but hopefully just tweaked Fred (back), Rich (shin) and T3 (face). Imagine if we were playing hardball! Games Thirteen and Fourteen: Home Run Derby! The Seraphim had a great week, putting on a hitting clinic. On Monday night against First Presbyterian, Ian hit a home run, then Cam hit a home run, then a couple innings later the floodgates opened as John Wilkens hit a GRAND SLAM with his family in attendance (way to go, John!). After that, the Seraphim decided to take it easy ~ they could have scored a lot more but decided to run only one base per hitter instead. The following night the Seraphim got a boost when Jake chose to delay his travel plans by 12 hours (that’s dedication), giving us a team of 9. The Seraphim accumulated a 17-2 lead by the fifth inning and like the night before, decided to put on the brakes. However, the New Life Disciples suddenly found their bats and had a 9-run inning, after which the Seraphim decided that they couldn’t afford to be that generous anymore. Each team scored one more run, and that was the 18-12 overture! At this point, the Seraphim are enjoying a three-game winning streak and four out of five as they head into the final week of the regular season, having evened their record at 7-7. Game Fifteen: Don’t Worry About This One. So let’s take a look at this Gospel Community Valor team. They are the best team in the league this year and the only undefeated team. Only two of their players seem to be over 25. In various games this year, they’ve scored 32, 29, 28, 28 and 28 runs. They’ve won five games by forfeit (perhaps because no one wants to play them). Tonight, they dented Lee’s car on an overthrow. We actually hung tight with them until the last inning when they broke the game wide open. Okay, yes, they won 18-3, but this was their second lowest scoring performance of the season. Next year they are looking to go to the Empire League, which is so competitive it has 17 divisions. So don’t feel that bad, guys, really. One game to go until the playoffs and we already know we won’t face this team again, perhaps ever. Game Sixteen: Ready for the Playoffs! Tonight a nearly-full Seraphim squad faced Living Word and handled the game easily ~ a huge bounce-back from last week that evened their season at 8-8, putting them in fine position for the playoffs. The team built a 24-2 lead on the back of pitching from John Rode and ended up winning 24-6 in five innings. Everyone hit well. Craig hit three triples in a row. Fred made a great rundown play at home. Looking back at the season (disregarding the game against the league’s only undefeated team), one can see that the turning point arrived right in the middle of the Islip double-header, when the team realized what it was capable of and never looked back. Next week: the playoffs! Our first round opponent turned out to be Living Word again. Behind precise pitching from Tino, the Seraphim were in charge from beginning to end. T3 hit into a bizarre play in which he was out at first and drew an overthrow that gave the Seraphim three runs early. Fred, T2 and Lee combined for a spectacular rundown play between third and home that included Fred doing a flip over the runner. The team hit smartly and fielded a near-perfect game. Final score: Seraphim 11, Living Word 2. Later that night, the team learned that two other top seeds had also lost, raising the Seraphim from the #5 seed to the #2 seed and giving them a home game against Pillar. The team has won five of their last six and hopes to keep this incredible energy going next week. Vacation/mission trip/surgery week struck for Game Two, leaving the Seraphim with only nine players. They put up a good fight against Pillar, rallying to close a gap only to see the other team come up with a rally of their own. The team was raring to go the next night but the game was rescheduled as the opponent’s Monday game had been rained out. Down to the elimination round, the Seraphim will face Patchogue New Creation for the third time this year. Tonight we faced the Patchogue New Creations, who had beaten us twice in the regular season. Each of those losses had been frustrating. In the first game, we thought we had won until we were told to play an extra inning in the fog. In the second we were one out away from a victory. But it’s hard to beat a team three times in a row, and the Seraphim were fired up for this playoff matchup. The team built an early lead, but only a few runs, and PNC nearly caught up. But an unprecedented triple play (Craig to Ian to John) sent the team’s energy through the roof. There was no looking back from there, as smart placement hitting, aggressive running and solid defense (including a late game double play) sealed the deal. On Tuesday the script will be flipped as the team will face Living Word, having already beaten them twice this month. But as proven tonight, anything can happen in the playoffs, so the Seraphim will have to stay strong and sharp in order to advance. Thanks to Ian pulling a double shift, the Seraphim were able to field a complete squad against Living Word. The Seraphim got off to a great start as Cam hit a solo home run on the game’s first pitch! Unfortunately that was it for the inning, and Living Word soon amassed an 11-1 lead by hitting deep and in one case over both fences at 12 Pines and into the yard across the street. The Seraphim fought back, closing the gap to 11-8 behind smart hitting and two great full body sacrifices by Craig to catch crucial hits. John Rode shut down the top of Living Word’s lineup in the bottom of the sixth, and the Seraphim were right where they wanted to be at the top of the seventh inning, with the top of their own order coming up. But Living Word’s pitching and fielding were strong, and the Seraphim were unable to close the gap. Despite this loss, the Seraphim can hold their heads high. They fought hard throughout the season no matter what the field conditions or number of players. They won games they weren’t expected to win. They had a solid run through the playoffs and battled until the very end. The highlight of the team’s entire history came in the second-to-last game with the triple play that no one will ever forget. We’re already looking forward to next season ~ thanks for a great year! For all the details from around the league, click here.